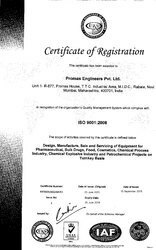 Promas Engineers Private Limited was established in the year 2005. Since its establishment, it has been prosperously blooming in the realm of engineering industries. We are primarily engaged in manufacturing and exporting of a wide array of sophisticatedly engineered equipment and gadgets. Our company is growing at a swift pace as one of the leading industrialists in our respective arena. Fostering the latest technological advancements and innovations we have been able to score a paramount presence in the industry. Promas is a reckoned name in the sphere of designing and manufacturing latest technology based process equipments. These advanced systems and equipments are used for various applications in Food Products, Cosmetics, Pharmaceutical, Chemicals, and Bulk Drug industries. Our exclusive range of superior quality equipments are well accredited by our global clients for their high efficiency and long lasting performance. Their robust construction helps them to bear all sort of wear and tear and to surpass even in the toughest situations. They are made up from finest quality raw material under the effective supervision of our production engineers. Therefore they are highly durable, tough, consistent, hard wearing and reliable. Our organization holds the ISO 9001 certification and the products are developed as per cGMP / USFDA standards from the initial Kilo Lab model to the final Plant Scale sizes with CE markings. To develop the immense level of satisfaction in our highly esteemed customers we facilitate them with customized solutions. The products are modified as per the required specifications suitably meeting the needs of the clients. Based upon our vast industry knowledge and understanding of the technological trends we have been capable of capturing a large share of global clients across the world. To strengthen the bonds with our corporate clients and to retain our valued customers we never compromise with the quality norms. Our highly skilled and technically efficient work force leads us to provide the best possible outcomes to the industry for maintaining an inimitable status in the global market. The state-of-the-art infrastructure of our enterprise is widely stretched in the area of 10.000sq.ft at Navi, Mumbai. It assists us to motivate our staff members by providing them with a comforting environment to carry out the fellowman ship. We have segregated our manufacturing, production and packaging units and each of them consist of modernized equipments and hi-tech machineries. To assure the flawless production of equipments there are well equipped laboratories set up for organized quality testing procedures. Our production operations are coupled with wholly integrated quality control and logistics facilities. All of us, individually, have a vision of our own. Itis like one beautiful landscape of our life, ever dynamic and being created everyday, every minute, based on ourday to day experiences. The collective vision at PROMAS is to transform and lead the process & pharmaceutical equipment industry, while at the same time understanding and appreciating the basic need that motivates us to continuously improve upon the experiences of everyone that PROMAS' business and philosophy touches - our employees, our suppliers and finally our customers. great human experience makes great business. To know each customer's needs. To always remain emotionally charged in a creative ambience. To work hard and smart to synchronise the above two objectives. To produce and deliver the best quality in a cost effective way. To go beyond business and at the same time celebrate the joy of being in business. Only a conscious Vision can be transformer into a spirited Mission. Design and supply of entire turnkey projects at any scale, from 500 kgs to 20,000 kgs capacities. We are resourcefully catering to the industry involving the processing or manufacturing of Food Products, Pharmaceutical, Chemicals, Bulk Drugs, Cosmetics, FMCG products, beverages and many other items. They have numerous applications in such industries such as they can be used for mixing, blending, formulating and filtering of merchandise like pigments, toothpastes, grease, synthetic dyes, viscous compounds and much more. Our equipments are often used in distilleries. We have a perfect combination of technically skilled and professionalized workforce in our team. There are quality specialists who hold expertise and excel in their respective fields. We have inculcated a sense of responsibility and gratification in our team that motivates them to work efficiently and enhance the productivity of the organization. We are capable of manufacturing and exporting bulk of orders with the aid of our professionalized work force for the ultimate satisfaction of the customers. Our team is fully trained, dedicated, hardworking and capable of handling emergency situations. We are one of the leading manufacturers and exporters of a wide variety of Process Systems and Equipments, mainly used in pharmaceutical, food processing, chemical and cosmetic industries. The products are fabricated from superior quality of raw material. Our range of Process Systems and Equipments is includes Sigma Mixer, Contra Rotary Mixer, Granulator, Jet Mill, Planetary Mixer, Dryers and Mixers and many others. We offer the entire range at comparable prices.